Vaccines don't have to be scary; in fact the vaccines at PetSupplies4Less protect your pets against scary diseases and can be administered by you! Solo-Jec dog vaccines protect against Canine Distemper, Infectious Canine Hepatitis, Canine Adenovirus Type 2, Canine Coronavirus, Parainfluenza, Canine Parvovirus (CPV), Leptospira Canicola, Ichterohaemorrhagiae, Grippotyphosa and Pomona. 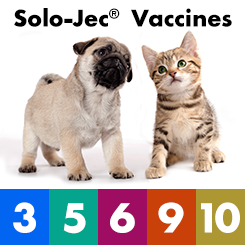 Solo-Jec cat vaccine Feline 3 offers protection against: Feline Rhinotracheitis, Calcivirus and Panleukopenia. These are viruses that can infect many parts of a pet’s body, ranging from their liver to their spinal cord, and may be fatal to pets that are not vaccinated. Helpful videos provided by Solo-Jec are included on the vaccine product pages that explain how to prepare your pet for vaccination, and how to vaccinate your pet right in your own home, where your pet is most comfortable. Vaccines are available in a single dose and come with a syringe, so protecting your pets is easy as possible for you. We also offer trays with 25 doses for those whom have an entire litter (or more) to protect; syringes are not included.